Every year I feel it gets more difficult to shop for my parents . . . i’m not the only one alone on this am I? I know, I could grab them a gift card somewhere, but anyone who knows me knows that I love to put lots of thought and time into my gifts. And guess what. . . this year you can too!! Last December I was trying to figure out what to get John’s sister and her husband, Karen and Miles. I wanted to make sure it was easy to transport back to New Jersey, but also make sure it was something thoughtful. I really might try these for Gus and Pearl. I had messaged Karen to send me a few profile photos of her 2 lil mcnuggets, Broderick and Rowan. 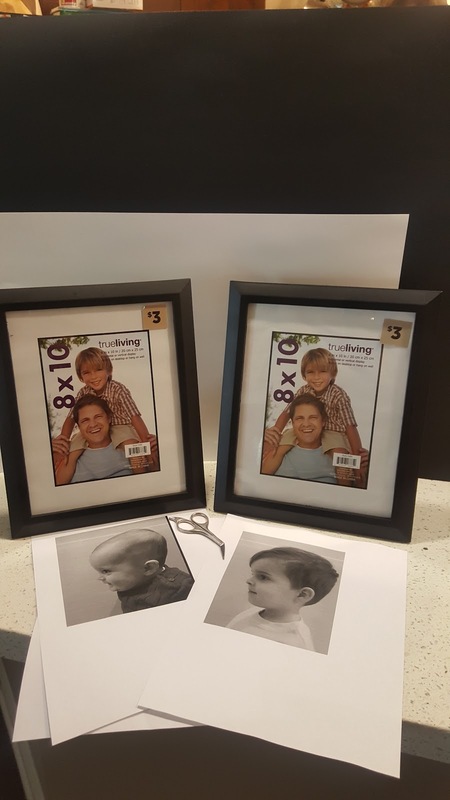 Once you have them, print them off, make sure it fits your photo frame you’re using. The last thing you want is to spend all this time on it and then they don’t fit the frame. Cut out every detail from curls to lashes, which I promise, the eyelash part can be the hardest part sometimes. Make sure to use super small and short scissors . . . the best ones I use are actually from the makeup section for eyebrows lol ! Just be patient and if God forbid you snip off something, just make sure you have backup print offs to start over and that this is just the demo you’ll be using to trace on the final. 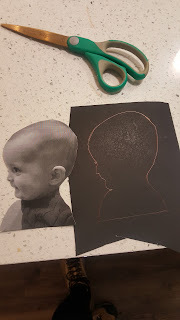 Now don’t get me wrong, you COULD cut your time in half and just modge podge the profile picture onto the black construction paper and THEN cut, but I prefer the longer way, that way if your mom wants to change it up and flip the silhouette facing right or left she is able to do so. 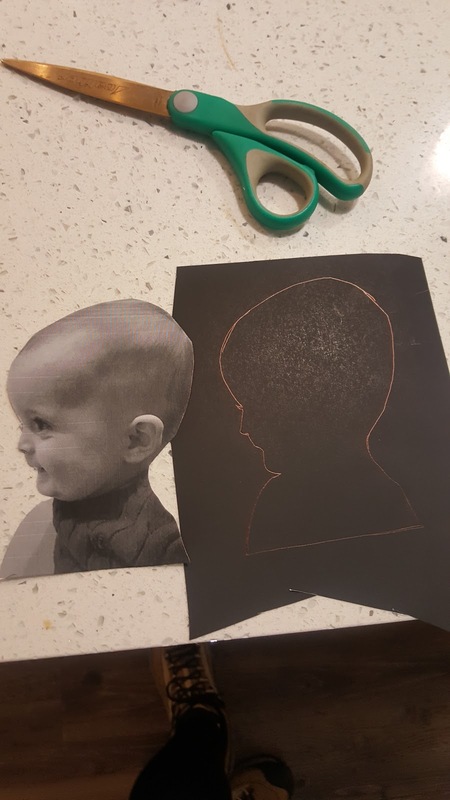 Using your pencil, trace the silhouette onto black construction paper. ; I did run into a bit of a hiccup with Rowan’s. 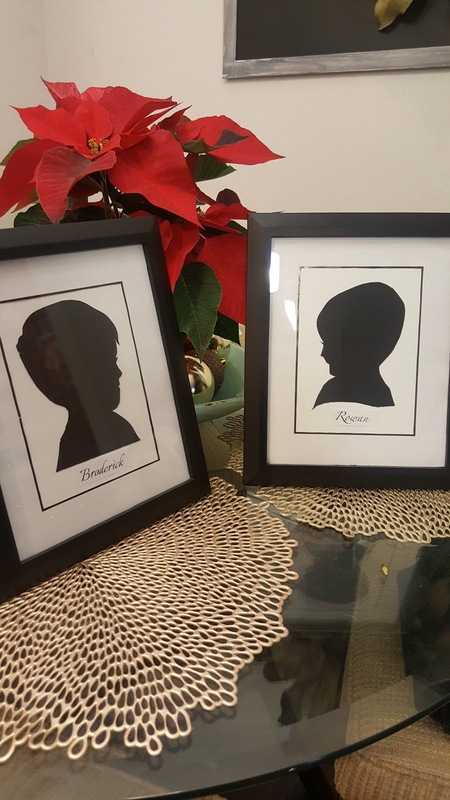 Babies don’t really have the ability to hold up their own head so I just used her brother, Broderick’s silhouette to trace the same neck behind her head for Rowan. The hard part is over yay!!!! Now, just simply place them in the fame. I don’t use modge podge or glue because the stencil stays in place in the frame. Plus, If you want to jazz it up for your mom, use cool patterned scrapbook paper as a background for each season or holiday! These are so cute! And I approve 100% of making pug silhouettes! Oh my gosh, what a great idea and so easy!!!! I'm totally doing this of our little Sully girl.